Whilst being on minibus duty on a recent Ten Tors training trip I found myself with a few hours to spare after dropping the team off. I had brought a reading book and a huge stack of marking as usual, but the weather was so inviting that I decided to have a quick march up to Yes Tor. 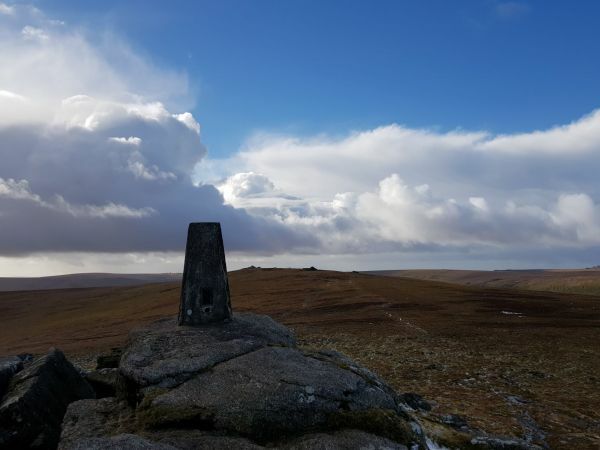 Last year when the same situation occurred I went up to Dartmoor’s highest point: High Willhays. This time though I felt that Yes Tor needed closer investigation. I had been there several times before but this time was the first on my own. I enjoyed the peace and quiet almost as much as the feeling of satisfaction at having got to the top (619 meters). 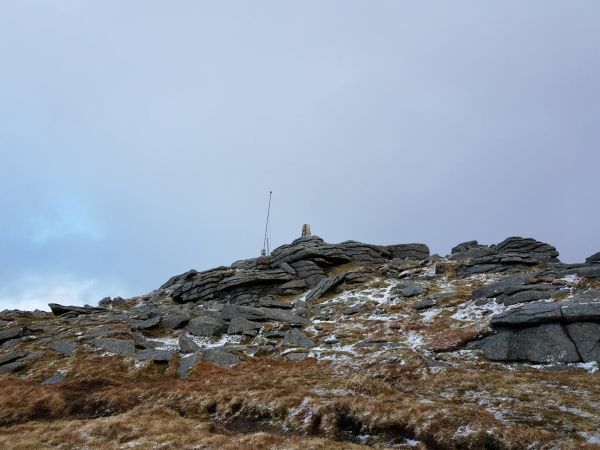 I was rewarded with several things: there was a trig point, a snow shower, a military flag pole and some cairns. I didn’t stay long to enjoy the tor as I knew that I had to get back to take the bus around to meet the team at their finish point but I was so glad that I had made this decision. The marking got done eventually! From leaving the bus to the top of the tor I had climbed 390 meters so I was pleased to add this to my #EverestAnywhere tracker when I got home. Don’t forget if you are visiting Yes Tor that it is in the Okehampton Military Firing Range danger area. Always check the internet before you set off to see if there is any live firing. Remember: if the red flag is flying on the top of the tor then you need to stay away until another day. Long time since I was on Yes Tor, but I don’t remember the flag pole. Doubt if there was a website to visit to find out about firing either – in fact, I don’t think there was an internet! How quaint! A funny thought but we too can remember a time before the internet. It has taken us many places so maybe not such a bad thing as people sometimes suggest?